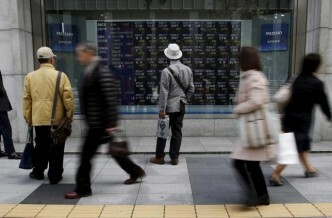 MSCI's broadest index of Asia-Pacific shares outside Japan climbed 0.4 percent. Wall Street shares posted sizeable gains overnight on several strong corporate earnings results and the pan-European Eurofirst 300 index of leading shares climbed to a 14-year high after the European Central Bank affirmed its loose policy stance. “Even if the actual number is in line with expectations, it will be enough to reinforce the view that the U.S. economic slowdown during winter was a temporary one, and thus support the dollar,” said Masafumi Yamamoto, senior strategist at Monex Securities in Tokyo. “If the dollar is to rise, it will gain more against the euro and Australian dollar rather than the yen as Japanese authorities have not exactly welcomed a further weakening,” he said.